Michael Dunlop will compete in the Superbike class for the Tyco BMW team in 2018. Michael Dunlop is due to make his debut on the Tyco BMW Superbike at the KDM Hire Cookstown 100 this month. Dunlop has submitted an entry for the first Irish national road race of the season, which takes place from April 27-28. The Ballymoney man ended months of speculation over his plans for the premier class in March after it was confirmed the 15-time Isle of Man TT winner had struck a late deal with Philip and Hector Neill’s TAS Racing outfit. He last competed at the Cookstown 100 in 2015, when Dunlop made his debut on the Milwaukee Yamaha. On that occasion, Lincolnshire’s Guy Martin bagged a double on the Tyco BMW, while Dunlop crashed out unhurt in the feature race on the YZF-R1. He later dramatically split from Shaun Muir’s team during practice week at the Isle of Man TT, reverting back to a BMW S1000RR machine provided by Stuart and Steve Hicken’s Hawk Racing outfit. Dunlop is also entered in the Supersport class at the Co Tyrone meeting on his MD Racing Honda CBR600RR. Last month, the 29-year-old turned down the chance to continue with Suzuki for a second consecutive season. He tested the GSX-R1000 at Cartagena in Spain at the beginning of March but later decided against renewing his contract, thanking Hawk Racing for their support. Following confirmation of his return to BMW power, Dunlop said: “I want to do a job, they need a job done and it is very simple. 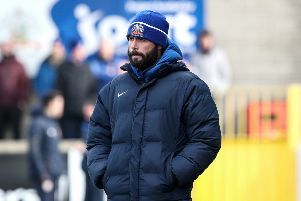 “They are local lads and a local team, so it’s easy to see that over the past few years it has been very feisty between myself and the team – things have been very hot-headed. “Once the team and I are together we will make a package and make it right. It might have been hot and heavy these last few years but it’s racing and everybody is rooting for the same things. Having Dunlop on the grid is a major coup for the organisers of the Cookstown 100, who have already announced a strong line-up for the 96th running of the race. His Tyco BMW team-mate, Dan Kneen, is not amongst the entries, although it is understood the Manx rider could compete at the Tandragee 100 in May. William Dunlop will ride the new-look Temple Golf Club Yamaha machines, while Derek Sheils – the dominant force at Cookstown in 2016 and 2017 – is aiming to continue his Superbike winning streak on the Cookstown B.E. Racing Suzuki. Exciting English prospect Davey Todd will make his debut around the 2.1-mile Orritor course for John Burrows’ Dungannon-based team, while crowd-puller Guy Martin also returns, albeit to contest the Classic race on his home-built 750cc BSA Rocket 3. McAdoo Racing is double-handed with new signing Adam McLean and Yorkshireman James Cowton leading the charge as they target success at the team’s home event. Irishmen Derek McGee – last year’s man of the meeting – and Michael Sweeney will also be eager to stake their claim for a share of the £13,000 prize fund on offer. Practice will be held on Friday, April 27, with roads closed from 12 noon. On race day, Saturday, April 28, roads will be closed from 10am.